On November 2, 2017 the recently deposed vice president of Catalonia Oriol Junqueras and five other ex-ministers arrived at Aranjuez prison, forty miles outside of Madrid. As they were removed from the police van, officers escorting them decided to make the prisoners stand in the yard and listen to the Spanish national anthem three times on a mobile phone. This act of petty humiliation set the tone for the subsequent fifteen months, with the Spanish judiciary seemingly intent on making an example of the independentist leaders. Now, the trial of Junqueras and eight other prominent Catalans is beginning in Spain’s Supreme Court, after over a year in which they have been subjected to “preventative detention.” Many within the independence movement believe a guilty verdict is a foregone conclusion, not least because leaked text messages from a leading Popular Party (right-wing) senator claimed that the presiding judge, Manuel Marchena, will allow conservative forces to dominate proceedings. The handling to date of the Catalan leaders’ case has indeed been eminently political. This owes not just to their punitive pre-trial detention, but also to the bizarre role afforded to extreme-right party, Vox, who will act as a third “private” prosecutor along with the public prosecutor and state’s council. This will give Vox’s lawyers the opportunity to interrogate witnesses ranging from ex-prime minister Mariano Rajoy, Barcelona mayor Ada Colau and the Basque first minister live on television. Just months before a series of elections in Spain, they could not hope for a better soapbox. The fallout of the October 2017 referendum has reshaped Catalonia’s own politics considerably. For Junqueras’s Republican Left party, the period of self-reflection over the last fifteen months has implied a strategic shift away from unilateral rupture, placing it at odds with exiled premier Carles Puigdemont’s center-right PDeCAT. Junqueras’s bid to achieve a broad consensus for Catalan self-determination is hampered not only by divisions on the Left, but also the wider rise of Spanish-nationalist reaction. October 2017’s dramatic standoff with the Spanish state inflicted heavy costs on the independence movement. Its leaders were jailed or forced into exile, and the structures of Catalan autonomous rule were themselves suspended for over seven months (the first time this has occurred under the post-Franco 1978 constitution). Meanwhile the unionist Right has gained across Spain, including to some degree in Catalonia itself, as Ciudadanos (Citizens) became the single largest party in the Catalan parliament at December 2017’s emergency elections. This period of intense political engagement has not led to the electoral gains the pro-independence Left in particular had hoped for. Though pro-independence parties maintained their narrow majority within the parliament, the Republican Left finished in a disappointing third place while the radical-left CUP lost six of their previous ten seats. Even beyond the electoral realm, CUP national executive member Joan Miró Artigas sees Catalan street movements as having entered “a cycle of demobilization and loss of position” as the possibility of a Catalan republic receded. The images of widespread police violence at electoral colleges on October 1, 2017, followed by sustained international media attention, seemed to play into this strategy perfectly. The Catalan leadership and civil society organizations had meticulously planned how to hold the referendum in the face of a legal crackdown, smuggling in ballot boxes from southern France and organizing a mass occupation of voting centers to stop them being closed down. Against such popular organization, the Spanish government’s attempts to suppress the vote, which the courts had deemed illegal, were largely counterproductive. The violence mobilized Catalan society and probably fueled participation in the vote, as thousands more Catalans came out to vote in protest in the afternoon and early evening. The turnout was remarkable, in the conditions: 2.3 million people (43 percent of eligible voters), 90 percent of whom backed independence. The images of brutality also swung international public opinion behind their cause, with even European Commission chief, Jean-Claude Juncker, forced to rebuke Mariano Rajoy’s Partido Popular (conservative) government for its use of force. In her book on the conflict, El Naufragio (“The Shipwreck”), Catalan journalist Lola García describes the forty-eight hours after the vote, marked by mass protests across Catalonia on October 2 and a general strike on October 3, as “a moment of euphoria” for the Puigdemont government. Yet as it sought to move forward in subsequent days, the limits to its unilateral strategy became increasingly clear. Notwithstanding its promises to confront the Spanish state and break with the existing constitutional order, the coalition government between Puigdemont’s center-right PDeCAT and Republican Left was essentially made up of centrists and moderate social democrats. Puigdemont, an ex-journalist, looked to Emmanuel Macron as a prototype for a new mold of modern politics while Junqueras had spent the previous eighteenth months cultivating an image of himself as a responsible finance minister seeking to transform Republican Left into a governing force. If the government had proclaimed a republic on October 3 or 4 as had been envisaged in the law passed by the Catalan parliament approving the referendum, or even on October 10 [when Puigdemont suspended the declaration to allow for back-channel talks], there still would not have been the type of institutional structures for a new state, ready and organized. However, with the mass mobilization in those early days in October, a declaration then at that moment could have been combined with popular resistance. You could have had a mass of people to protect the [Catalan] institutions and the government members inside. We might not have achieved political independence if this had actually happened, but we would have further deepened the crisis of the Spanish state with a view to forcing the Spanish government to sit down and negotiate. According to García, such a popular uprising had been discussed within the government’s inner circle, with stockpiles of supplies and a satellite phone installed in the presidential palace. Yet, from the government’s perspective, the consequences of such an escalation of the conflict looked increasingly uncertain, as it became clear they had made miscalculations on two fronts. Second, the Catalan government had not expected such a swift response from the region’s two major banks, Caixa and Sabadell, which relocated their company headquarters elsewhere in Spain on October 5. Though a largely symbolic move, it came as six billion euros were withdrawn from the Catalan banks in the week after the referendum and was accompanied by dire warnings from business leaders that a declaration of independence “would be like a bomb going off in the Catalan economy.” Capital was exercising its veto, threatening a mass exodus of companies and investment. Yet there was also a third element that made any rapid move towards a declaration of independence difficult, and which complicates the CUP’s analysis of the October events. For many Catalans, October 1 had been what Barcelona en Comú’s Jaume Asens called a “day of confluence:” that is, a broad mobilization which aimed to unite all Catalans in favor of the principle of self-determination. Political analyst Iván Orosa has explained the broad social reach of this “confluence,” as thousands of Catalans cast their ballot to express disapproval at the central government’s suppression of the vote rather than out of a desire for all-out independence. While polling shows 80 percent of Catalans support their nation’s “right to decide” via a binding referendum, pro-independence parties have never won a majority of votes in elections, only seats, with their combined support reaching 47.8 per cent in the 2015 elections. For Joan Mena MP the key flaw of the unilateral strategy was that it was never able to take advantage of this wider transversal consensus around self-determination. This consensus is one that his party, Commons, which emerged out of the successful leftist electoral alliances Barcelona En Comú and En Comú Podem, believes still exists now, albeit in a different form. As he told Jacobin: “Catalonia only advances when we are capable of mobilizing broad majoritarian support, such as with the Indignados/15M movement, which was a mass mobilization in favor of democratizing the Spanish state, or last year’s Feminist Strike on March 8.” In this sense he sees the great strength of the initial protests after October 1, such as the general strike, as their “framing in terms of defending democratic rights against state repression.” These protests were also able to generate wider legitimacy through the participation of non-independentist trade unions as well as figures such as Barcelona’s left-wing mayor Ada Colau, a long-time housing activist. Any move to declare independence risked fracturing this broad front. However successful it may have been as a form of popular mobilization, for Colau and the Commons the October 1 vote could not provide the government with a legitimate legal mandate for a unilateral declaration. Even the international observers appointed by the Catalan government noted that “due to the circumstances and the [Spanish] government’s response,” the vote did not meet the basic legal guarantees needed for a binding referendum. According to activist and writer Luke Stobart, as the focus turned to a possible declaration on October 10, “a significant layer of Catalans that had mobilized for the referendum and against police violence peeled away from active protest, unsure of the movement’s democratic case” and so, in turn, further weakened the movement’s position. After series of further delays and hesitations, and with the Partido Popular’s Pablo Casado threatening the Catalan president with the same fate as executed civil war leader Lluís Companys, it seemed on October 25 that Puigdemont would back down from a declaration and instead call for elections. Announcing his decision to the cabinet, he told his colleagues: “I don’t want to be president of a virtual country” and “I refuse to go around the world handing out business cards for a nonexistent Republic.” Yet with calls of “traitor” reverberating through independentist social media, and Rajoy refusing to allow Puigdemont any form of dignified climb-down, an eleventh-hour U-turn saw this exact scenario play out. Within days he was in exile, with his government having not even gone so far as to remove the Spanish flag from the Presidential Palace. The intervening fifteen months leading up to the trial have brought ample time for reflection. As Republican Left MP Gabriel Rufián told Jacobin, the events of October 2017 now figure as a kind of “loss of innocence” for the Catalan independence movement, given the nature and extent of the central state’s crackdown, the absence of the anticipated support or mediation from the EU, and the capital flight from the region. I am now going to set out three questions that I will also try to answer. The first is: which path should we take [towards independence] … ? The Republic has to be built along a very wide path that includes many people and above all a diverse range of them. The second question is who do we take that path with? … What is clear is that we have to connect independentists with those in favor of some kind of self-determination. Thirdly, we have to explain: how is it to be done? And we have concluded that the following can only be explained by coming to terms with a crucial reality — we need to be more. We have to accumulate forces. In the veteran MP’s analysis, there appears to be a certain recognition that the movement is not only found wanting in terms of voter numbers, but that it will also require a much broader and deeper social base in order to make an independent republic a realistic possibility. Another crucial question this consideration raises is one that left-wing independentist forces have had to grapple with since they began to agree to governmental pacts with the center right: what kind of a republic do they want? Carles Puidgemont’s party was the largest pro-independence force in December 2017’s regional elections, allowing independentist parties to maintain a narrow governing majority. Now, the Republican Left is attempting to chart a path that not only pulls back from at-all-costs unilateralism, but also seeks to anchor the independence project more clearly in long-running economic and social demands. This shift in strategy raises several challenges for the Republican Left to navigate. Part of the difficulty the party faces in attempting to mark out its new route is that it finds itself locked in a battle for hegemony with the Catalan center right, which does not appear to have pulled back from a hard unilateralist line. Some have argued that over the coming months PDeCAT may even prefer to re-escalate tensions between the independentist bloc and the Spanish right, anticipating an enormous public response across the region and potentially beyond as it approaches the May sentencing and election dates. García has pointed to a tendency, visible in recent years, for the momentum generated by the independence movement to reward right-wing Catalan parties electorally, notwithstanding the large public opposition to their austerity programs. Such was the case in December 2017’s emergency regional elections, which saw PDeCAT secure more votes than any other independentist force as Puigdemont campaigned in exile. For the Republican Left, conversely, helping to oversee right-wing policies, as well as moments of perceived retreat on the terrain of independence, had the opposite effect at the ballot box, as Orosa notes, having “brought the party into a [brief] electoral winter [period]” following the 2008 financial crash. The current conjuncture also limits the potential for cooperation on the Left within the Spanish state. Last June Pedro Sánchez’s Socialists (PSOE) joined forces with Unidos Podemos and regional parties to oust Mariano Rajoy’s government. Yet amid an escalation of tensions around the question of Catalonia, and the increased radicalization of the Spanish right, this new bloc has failed to operate as an effective parliamentary majority. In voting to elect Pedro Sánchez as Rajoy’s successor, both Unidos Podemos and the Republican Left had bet on this majority’s ability to reorient the political agenda towards securing social advances and rights for Spain’s workers, as well as taking initially conciliatory steps on the national question. Such steps have included the repatriation of Catalan prisoners, as well as an investment program for Catalonia in the 2019 budget agreement that meet the levels promised in the 2006 Statute. Yet these concessions have not proven sufficient, as sharp tensions persist. The motor for such social advances was meant to be the Socialists’ national budget plan, which parliament will finally begin to debate on Wednesday. Last Friday, however, its chances of success reached a new low after communications between the Catalan and central governments appeared to break down altogether. The former blamed Sánchez’s inability to take on the Right in his party, already cowed by the December regional election results in Andalusia that had brought the far right its first significant electoral breakthrough since the Transition. Its electoral vehicle, Vox, is now polling 10–12 percent nationally and marking much of the broader Right’s agenda. Sánchez’s final roll of the dice in the negotiations last week, which involved agreeing to have a neutral observer attend talks over the independence crisis (a move that provoked hysteria and further mobilization from the Spanish right), appeared not to pay off as Madrid and Barcelona reportedly cut off communication[s] completely. This week he took to Twitter in one final arm-twist on the budget vote, arguing that independentist forces and the Spanish right, which have been violently at odds since 2017’s independence push, were inexplicably coming together to defeat the progressive package. Failure to pass the budget can only play into the hands of Spain’s radicalized right-wing bloc who would likely seek to deal a devastating series of blows to Catalan self-determination (including reapplication of direct rule and the threatened outlawing of independentist parties) should it find itself in office again after likely early elections. Such deadlock also complicates relations on the Catalan left. One of the main consequences of the party’s strategic shift has been to create an interesting dynamic between Republican Left and the Commons, defined by increased rivalry but, at the same time, also raising the likelihood of a potential alliance after elections in May. A force in Catalonia which has sought to combine the social demands of the Indignados with a push for self-determination, the Commons would appear to be exactly the kind of group Tardà’s recent analysis would apply to. With the formation of Catalunya en Comú-Podem in 2017, the new party looked to gain ground in the region on the back of Barcelona en Comú’s historic municipal victory in 2015, and by positioning itself as an autonomous force rather than merely as Podemos’s Catalan branch or affiliate. Yet it has proven difficult for the group to gain traction in the wake of the 2017 independence drive, as En Comú Podem found limited purchase for its social program in a scenario increasingly dominated by tensions over the national question. Indeed, it dropped three seats in the December 2017 election. On top of this, the grouping has also not proven immune to the enduring internal divisions and apparent loss of direction that continue to afflict the Spanish left at both regional and national levels. In particular, Xavier Domènech’s decision to step down as party leader towards the end of last year was viewed as a loss of a key unifying figure for the regional formation. Arguing “municipalism is more in its DNA” than any other kind of politics, Mena hints that the Commons’ pitch at local elections this May will be built on selling the impressive work it has carried out in Barcelona city hall. He cites mayor Ada Colau’s proposal for a new municipal dental service as one recent example of such work, adding “we reject those using the [upcoming] municipal elections to resolve the national conflict, which is completely irrelevant here.” However, a harsh sentence for the Catalan leaders just weeks before voters go to the polls could make reelection extremely difficult for Colau, even if she remains one of the most popular politicians in Spain. 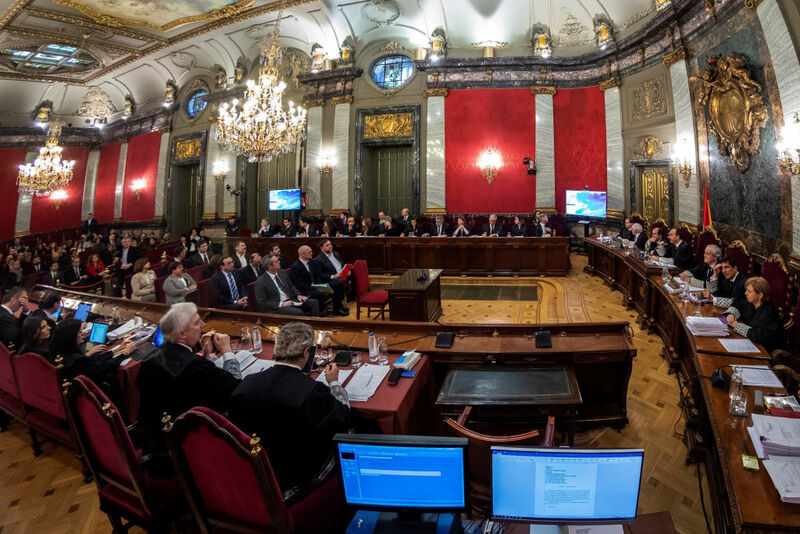 With a verdict set for early May, and sentencing due to take place in the summer, Barcelona en Comú like other left-wing forces across Spain may experience considerable difficulties in an electoral panorama dominated by the national question. Facing stiff competition from Republican Left and (on the unionist side) Ciudadanos (which is backing former French prime minister Manuel Valls for mayor of Barcelona), Colau’s campaign will focus on selling her record in office. Its success on this front could, in its own way, prove a test of the Spanish left’s social program confronted by an increasingly dominant national question and a wider lurch to the right across Europe. For some time, Spain was thought to have been a kind of anomaly to this broader trend. But reactionary forces appear to doing their utmost to convert this trial into a springboard for an electoral assault at a time of declining left-wing mobilization. And in one particular sense they are right to see it that way: the outcome will likely have far-reaching effects on the direction of Spanish politics for years to come.